What should the A’s do with the 10K “La Potencia” Yoenis Cespedes shirts? The Oakland Athletics were scheduled to give away 10,000 Yoenis Cespedes shirts this weekend. But today’s trade of Cespedes now has the team wondering what they should do with the shirts. It’s a tough situation for a marketing standpoint because there are fans who bought tickets so they can get the shirt. But the shirt is now irrelevant. Should they go the route of the giving it away as scheduled like the Indians did several years ago? Or do the Athletics just scratch the promotion and try to find some kind of resolution? It’s unlikely they can come up with 10,000 replacement shirts in time, so they must find something else to do. When times were good with Yoenis Cespedes. This was a huge move that woke me up. In fact, the text woke me up telling me to check Twitter. Yoenis Cespedes gets traded to the Red Sox for Jon Lester and Jonny Gomes. WOW. The A’s rotation is stacked now. Pitching is their key to the small window of hope for the World Series title. Lester is a free agent as season’s end, but this rental is a huge move. Getting Jonny Gomes back is also a really nice addition. But losing Cespedes is a tough one to swallow since I am a huge fan of his. But this move is like the Billy Beane of old. Cespedes was going to be entering his final year of his contract next season. He wanted to stay, but the market probably said he wouldn’t stay. The idea was to do what Beane would do in the past and trade a star before he cost too much. This was it. But instead of prospects, Beane knows he needs stars now. This was that. Earlier this year I was with the NFL Network and I worked the entire week in preparation for the Pro Bowl. I really liked it. The new format of picking your own team was a fun concept that I am glad the NFL adopted from the NHL. The uniforms weren’t all great, but it was nice to see something different. Overall, I actually had more interest in the Pro Bowl than I had in years past. With this new announcement, I hope this generates more interest. It’s still the Pro Bowl, a meaningless exhibition game. But at least to me it’s more fun now. I like it. 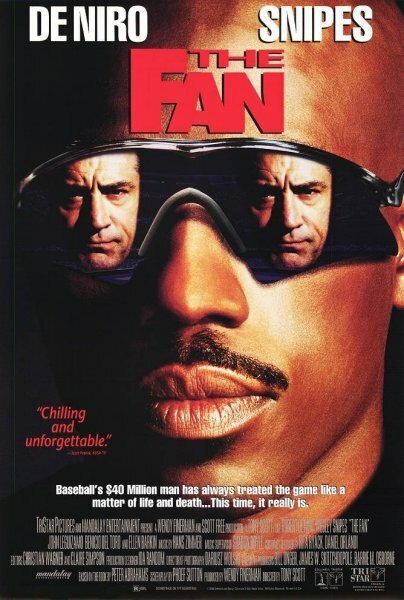 In 1996, a movie called “The Fan” was released. It was about a deranged, obsessive baseball fan who went to crazy lengths to try to “help” his favorite ballplayer succeed. Of course, it wasn’t fandom, but an unhealthy obsession that led to stealing, kidnapping and murder. I was only eight when this movie came out, so I never got a chance to see the movie. It wasn’t until last night I saw it on Crackle and decided to watch it. The plot of the movie in itself isn’t a bad one. There are plenty of crazy fans that go too far for their team or a favorite player sometimes. This story did go a little extreme, but the premise of this movie isn’t something that is out of the ordinary. But sadly, that’s where the movie fails. As good as the story was, the storytelling was horrible. So why do I feel compelled to tell my thoughts on a movie that was released 18 years ago?